Italy’s DYRNWYN have been raising the sword for Roman-themed pagan folk metal for six years with three releases now under their war belts. Their 2013 demo, “Fatherland,” planted their flag amongst scores of similar bands in this current wave of European folk metal, keeping a raw sound reminiscent of early MOONSORROW, WINDIR and ENSIFERUM, while conceptually resembling fellow countrymen like DRAUGR, STORMLORD, ADE and Italian-Canadian Maurizio Iacono’s EX-DEO among others whose lyrics similarly focused on the life and times of Julius Caesar. 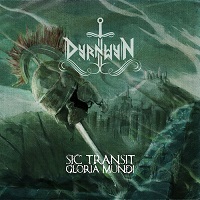 With so much competition in this micro-genre, can their first full-length “Sic Transit Gloria Mundi” have the magic to put them on a level of their own? To start, they’ve enlisted producers Riccardo Studer and Alessio Cattaneo of Time Collapse Recording Studio whose knack for grand orchestration shows immediate results, making the demo and 2015’s “Ad Memoriam” EP sound archaic in comparison. Orchestral strings tastefully permeate the album’s 47 minutes, lending a cinematic feel with giant open guitar chords replacing a lot of the black metal riffing on their initial output. The result is that the sound is full but not fatiguing, and they mostly succeed in keeping the identity they forged on their first releases, which includes the liberal use of “ancient” instruments like flutes, acoustic guitars, harps, accordions and tambourine. An accordion takes the lead in “Cerus,” a track which begs direct comparisons to the aforementioned ENSIFERUM. "Parati ad Impetvm” gives the feeling of a long tiresome march with a call-and-response chorus between a commander and his troops. On “…Para Bellum” we get a taste of tremolo picked guitars that leads into a powerful breakdown, while an accordion features in the climax playing against a blast beat to odd-but-pleasing effect. No melody or instrumental section overstays its welcome here, with brilliant contrast on each song, like on “La’Addio del Primo Re,” which starts with a mesmerizing fireside AGALLOCH-esque acoustic intro, transforming into a deadly marching beat with cinematic strings, leading into a dancing flute section and an interlude of acoustic guitar playing to a tambourine beat. “Il Sangue Dei Vinti” is a brooding imperial march, featuring the heaviest use (and the only one that could be called cheesy) of electronic strings and battle sound effects. “Feralia” is a scorcher, with drummer Ivan Coppola providing an insane blast beat to go with an epic chorus that recalls the best of atmospheric black metal. “Assedio di Veio CCCXCVI” closes the album in true epic form as we are treated to an array of speed changes and surprises, with a brilliant flute and muted guitar dance-in-the-mosh-pit section that is sure to be a highlight of live shows to come. The smart production, pacing and shades of contrast on the album make it one of the most easily digestible and powerful folk metal epics you will ever find. It may not serve to fully differentiate DYRNWYN from their brethren, but it is a shining example of everything good about genre of metal that has blown up since the early 2000’s and continues to thrive. Thank Zeus!